It seemed as though the second week flew by and the final day had come at last. Ngozi had been invited to give a lecture for the Physiotherapists in the New Mulago hospital, where some of our more difficult ICU patients had passed through. Compared to the spinal ward, the New Mulago was the Bellagio. It had been established in the 1970s by Idi Amin, the Ugandan President, as a military hospital and it was considered among the most prominent hospitals in East Africa. In reality however, the Mulago hospital, like the spinal ward, is now in serious need of “rehabilitation.” The team really appreciated Ngozi’s didactic teaching and demonstrations and insisted on exchanging contact information for future correspondence. 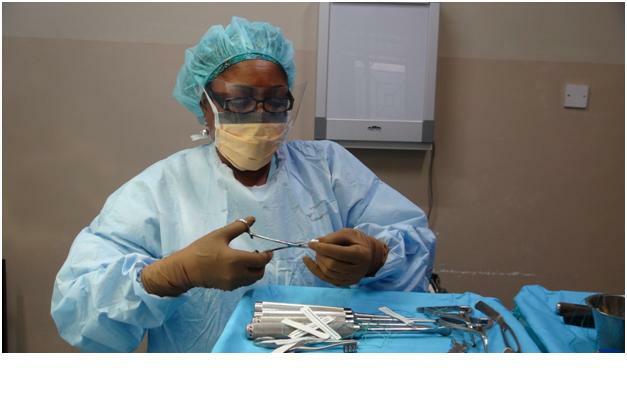 Ngozi was relieved and delighted that she had gone from rejected to respected in terms of the value of her services and relationships with local physiotherapists on the spine mission and her patients. She even got a wave out of B.A., the 7 year-old girl from Monday who wouldn’t crack a smile. Ngozi hosts a physiotherapy lecture for here like-minded colleagues on this side of the world. 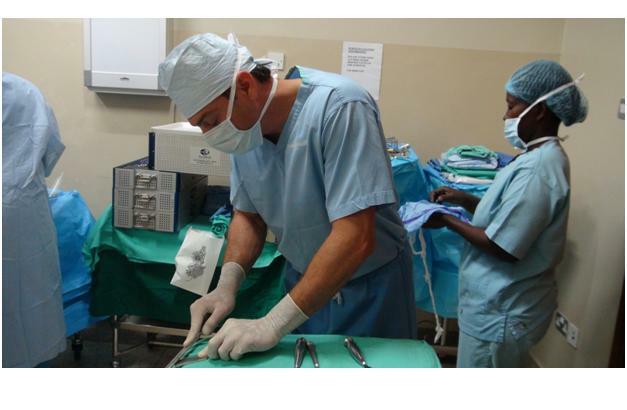 Having already completed 16 surgeries, we expected a smooth final day in Kampala. But, as you may have guessed, fate struck us once again and the Mulago system tried to siphon off our last bit of energy. We arrived eager and early just to learn that the water supply to the autoclave had been disrupted, so the surgical tools could not be sterilized. We waited three hours for the water to come back on, and were finally able to start at 12:05pm. The procedure was for M.W., a 51 year-old female school teacher with mechanical back pain with radiation to her legs since an accident in 2001. Two years ago she had a decompression procedure but had no substantial pain relief. She wore a back brace and used a cane with only minor relief of symptoms. Recently she had been experiencing right arm weakness and right-sided neck discomfort presumably due to neck problems. An MRI showed degenerative changes and narrowing of the spinal canal and intervertebral foramina (the opening where the nerves exit the spine). The team, with the help of interested local orthopedic residents and students, conducted a posterior L4-5 lumbar decompression and fusion. They approached from the back, removed part of the lamina (back wall of the vertebrae)and the arthritic facet joints, gently moved the nerves aside (this low, called the cauda equina, or horses tail) while working to remove the disc and replace it with bone graft and a cage. They also inserted screws to maintain the spinal column stability until the bone fusion consolidated. Despite the late start the team still completed the case efficiently and all went well. The operating room is the perfect example of many people working as a team to accomplish something amazing. At the end of these two anxiety provoking, yet gratifying weeks, we were ready to return home, but all struggled with the thought of leaving behind so many in need. Despite the emotions , as we left to pack our equipment and get ready for the trip home, patients expressed their deepest gratitude and pleaded for our contacts so they could keep us informed on their progress. The team still however had one final challenge, get the equipment packed and collected from two hospitals and loaded onto Mr. Metu’s truck (the local shipper) to be sent home, all in time for a celebratory dinner . Brian worked effortlessly to catalogue and box the gear while we shuttled boxes up and down stairs to the shipping van. Lieberman set a challenge, “dinner at the Lawns by 8pm.” We arrived at 7:55, for a fine meal of Ostrich burgers and Chili Crocodile, serenaded by the clapping of rain on the wooden roof. At dinner we shared our thoughts and feelings, our perspectives on the value of the mission and how we could continue to improve future missions. We spoke of the strength and brother (& sister)-hood of the human spirit, our impact and how the Ugandans continue to learn from us, and we from them. The group huddles together one last time for a photo with the chef at The Lawns, where many team members sampled exotic meats. This young woman told our group that as much as she appreciated our team’s medical assistance, what meant the most to her was how much she was truly cared for this week. “The behavior of the Uganda peoples is like video games. They think they have three lives. But this is not true. They have only one.” – Kris, on the whimsical attitudes and reckless standards sometimes encountered in the equipment, protocols, and patient care guidelines in Uganda’s health care system. This year’s mission set the standard for productivity, emotions and future goals. New lessons were learned and old lessons were re-affirmed. The veterans were solid and the rookies were dependable. I am consistently reminded of how many good people there are on this planet. Likewise I am constantly reminded of just how much need there is throughout the world. I strongly suggest that if anyone reading this message has even the slightest inclination to become involved or contribute to such a mission, please seriously consider the opportunity and take the leap to participate. It will change your mindset and your life. Personally I will remember this mission as the most special on three accounts. 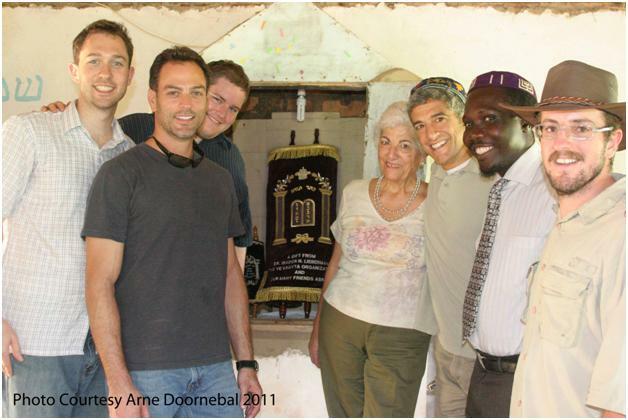 I had the privilege of having my mother (Noemi Lieberman) accompany the team and myself on part of this mission; I was accompanied by three of my most respected colleagues (Kayanja, Siemionow & St Clair); and I was able, with the help of many, fulfill my promise to deliver a sefer Torah to the isolated Jewish congregation in the village of Putti. By virtue of my position I tend to undeservedly get the all the credit for these missions. It is impossible for me to ever fully acknowledge all those who have contributed to the success of this mission. Please rest assured that I will I never take for granted all those who have contributed along the way. 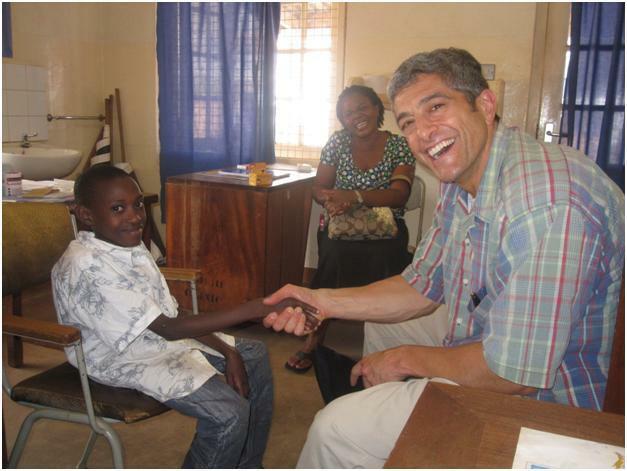 Dr. Lieberman leaves the kids he sees with a smile on their faces, every time without fail! The last kid given a Kinder Kit this year wasted no time in getting to work, ready to work and learn. Dr. Lieberman consults with a young patient at Mulago hospital, giving advice and hope to her mother. Before heading to the Case operating room for surgery the team split up and saw post-surgical patients in the wards at Case and Mulago. At Mulago, Zbigniew, Siemionow and Jordan visited with three patients, who needed their surgical wound dressings to be changed. Patient J.S., a 35 year-old male was running a high fever since his surgery, while patient P.K. had trouble breathing at night, so required help from the BIPAP machine to breathe for him. Meanwhile in the clinic up the hill, Dr. Lieberman presented a lecture on congenital scoliosis to an audience of very interested surgeons and residents. It is important on our medical mission to make a lasting footprint by empowering the local physicians to improve their standard of care in addition to helping patients directly through surgery and consultation; we are only in Uganda for 2 weeks per year and must also think about the other 50. Even Master PT Professor Ngozi, PhD was asked to teach and present on key concepts in physical therapy – at both Case and Mulago. The surgical case today was a 15 year-old boy A.T. who suffered from persistent complications of tuberculosis. He had surgery in 2009 for post-TB complications, but afterward developed a chronic, draining infection. Now, his hardware had become loose and he had multiple levels of bony breakdown (osteolysis) and inadequate healing of bone (pseudarthrosis), with a substantial left-sided abscess. In May, he underwent a procedure to clean it out (debridement) but it was unsuccessful. Our plan was to repeat the debridement of the incision, abscess, and tract and to remove the loose broken hardware. During the surgery, it was impressive just how much granulomatous (gunky) tissue had been created by immune cells attacking the unresolved infection. We saw three new patients today. The first was E.N., a 2 ½ year old girl with congenital scoliosis. Had we seen her last week, we might have been able to squeeze her in, but now due to time constraints she would have to wait until we return next year. C.A. is a 24 year-old female with history of progressive leg weakness over three years and lower back pain. She had extreme lower extremity weakness (1/5 on the power scale) and allodynia, the sensation of pain in response to a non-painful stimulus (eg. gentle rubbing feels like burning). 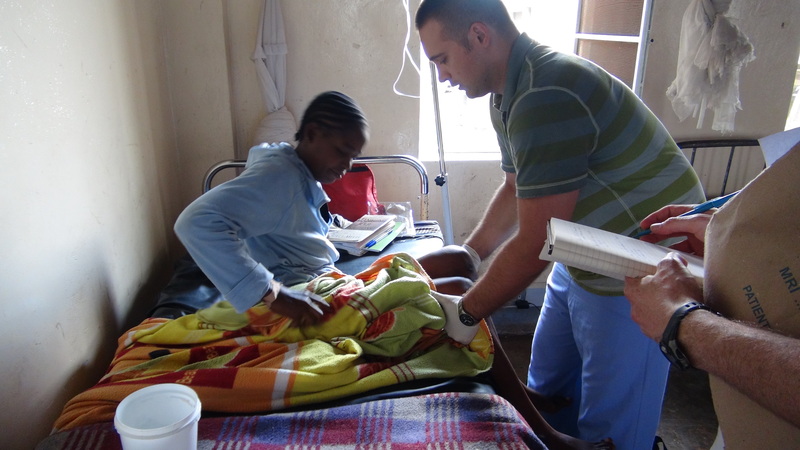 In the absence of imaging studies, Jordan and Dr. Ilalov exercised their differential diagnosis skills, ruling out vascular and autoimmune causes (the latter not at all common in Uganda) and suspecting a compressive lesion within her spinal cord, like a tumor. However, when Dr. Lieberman examined her he concurred that her symptoms are most consistent with a compressive lesion. It was then that she pulled out the secret X-rays of her back and it was clear that she had a focal kyphosis at the T11/12 disc level with a spondylolisthesis and disc resorption. Unfortunately, since the process had been going on for some time, the team felt that the damage was irreversible and surgery would be of minimal benefit. This was sad news to break, but having dealt with immobility for almost three years, it was not surprising to her. The third patient was J.K., a 48 year-old male who was transferred from the trauma unit after a motor vehicle accident. Aside from being paralyzed from the shoulders down, he suffered a head injury and was confused and unable to speak (aphasic). He also had chemical burns over his body, but we could not illicit the history because of his head injury. His CT scan showed complete obliteration of the spinal canal (bone severed cervical spinal cord). This is the sad reality of spinal cord injury – and even in developed nations, motor vehicle accidents account for 50% of spinal injuries. After a busy and interesting surgical challenge, Kirill didn’t have the stomach for dinner at the beautiful and sometimes delicious Serena hotel. Actually, he didn’t have the stomach for anything but a loading dose of Cipro. At dinner, the team howled at stories of spine missions passed (and present) and after the “Sister Sarah fiasco” yesterday, we did a “what time would Wednesday’s surgery begin” pool, Price is Right style: closest guess without going over wins! 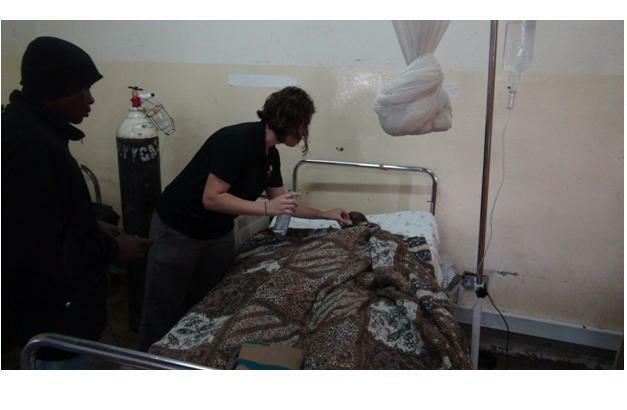 Kirill examines a young woman at Mulago hospital. She has been losing mobility and strength in her legs over 3 years. 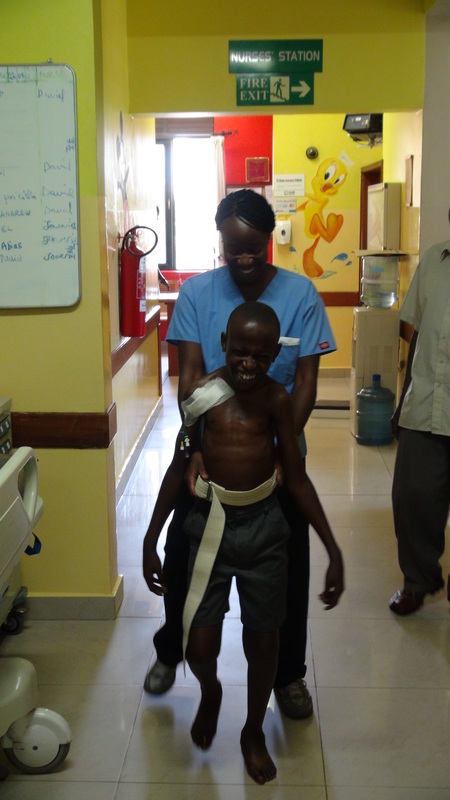 A post-operative young patient beams through the hard work of getting up and on his feet again. It sure looks like Jordan’s getting the hang of this “doctoring” thing. Dr. Siemionow examines a patient he has been working with and reports, “Everything is OK” in his cool, calm demeanor as always. Monday morning started with shock and awe. Throughout the week Skumolski and Lieberman, like a Swiss train consistently opened the gym at exactly 5:30 am for their workouts. Occasionally Brian and Ilalov would wake early enough to get there as well. This morning however the exercise addicted duo were astonished that the girls, Ngozi and Jordan, sporting their morning faces, succumbed to the peer pressure and came to work out as well. The small gym was packed with team members working off the great food of the week. Once showered and fed we started with the clinical day and visited our post-operative patients. P.T. , the 14 year-old girl with scoliosis and the elevated chest plate, was recovering well on the breathing machine. The second part of her surgery would have to wait until next summer. 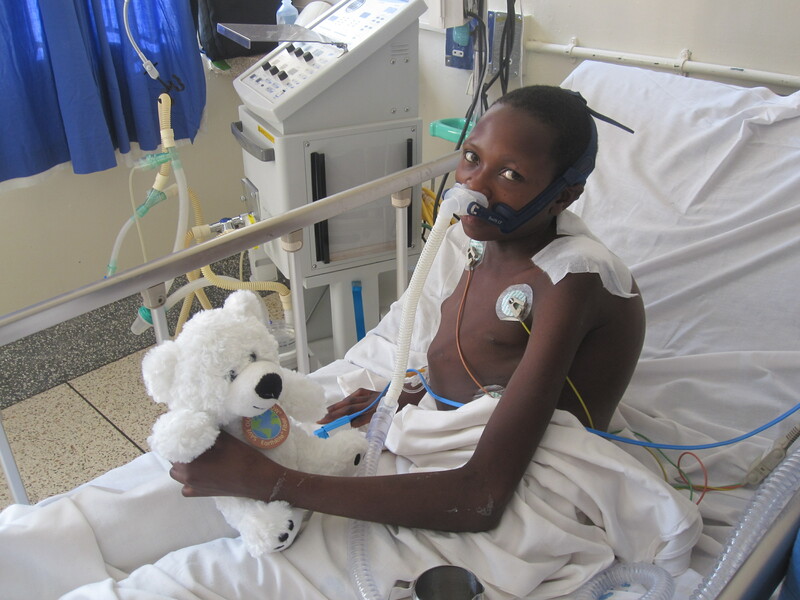 She smiled at the sight of her new teddy bear, one of several Sherron brought for our pediatric surgery cases. I.K., the 64 year-old ACDF patient from Saturday noted improvement in her leg pain, recovered speedily and was discharged today. A.W., the 15 year-old boy with cerebral palsy and kyphosis smiled at first sight of the team. P.T. with her teddy named “Nice.” She is wearing the BPAP machine installed by Drs. Szkulmowski and Kusza. Surgery at Case began at 10am. The patient B.A. was a 7 year-old girl with congenital scoliosis who was seen in the penalty box one week earlier. She had a T7-L3 instrumentation and fusion procedure, which involves the installation of screws and rods spanning 9 vertebrae and placement of bone chips to grow into and stabilize the spine. Drs. Lieberman and Ilalov strategically placed the Globus-supplied screws then contoured the titanium rods to match the contours of a healthy skeleton. Both would assert that surgery is just another word for “controlled violence.” This surgery went off without a hitch and at the end Dr. Ilalov patiently taught Jordan how to throw some stitches. Dr. Lieberman and Dr. Ilalov work hard on the last case at CASE. “Sister Sarah strikes again!” We should be lucky she struck at all! The doctor from whom we removed infected hardware was found to have a serious multi-organism infection, resistant to most available drugs, including the broad-spectrum antibiotics he was already taking. We all hope he can get a permanent intravenous line and the appropriate antibiotics. Luckily, he is a prominent physician in Kampala and has the means, the connections and the know-how to afford and self-administer the treatment. Ngozi will have this patient walking around in no time! At the end of this long week, these three mystical days seemed to blend together into one. 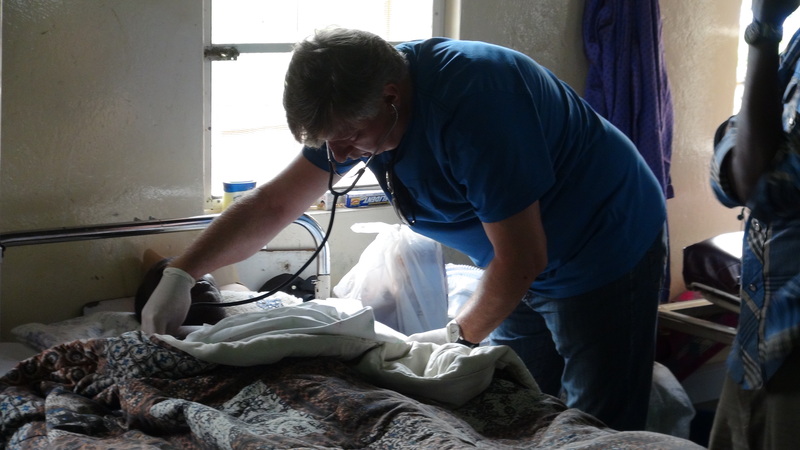 On the spinal side of things, the mission team split up so some could stay for the surgery on I.K., a 64 years-young female patient who was postponed earlier in the week pending blood test results. Sometimes, a low Vitamin B12 level can cause the same neurological symptoms as an insult to the spinal cord. So, to justify a surgery, we had to rule out a B12 deficiency (pernicious anemia). Overnight Friday, her blood tests came back and showed her to have a normal B12 level, so Drs. Kris and Kirill reassessed the patient on Saturday morning and went ahead with the surgery at Case hospital. It was another straight forward spine procedure even with poor lighting and less than ideal instruments. 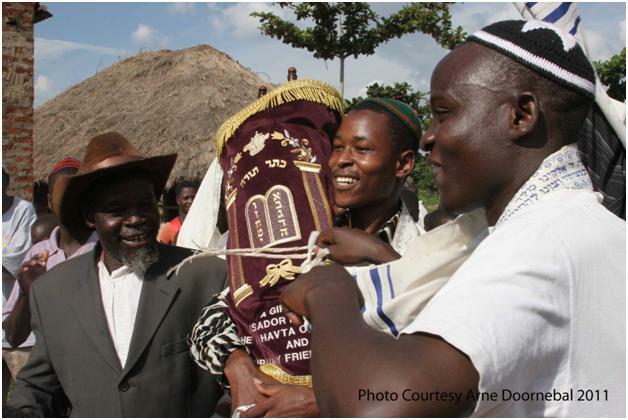 Early Friday morning, the second half of the team ventured upon the final leg of the torah mission to Putti, a small village near Mbale (“Em-ball-ay”). “Ohhhhhhh Lord,” we prayed, “please deliver us and the precious sefer Torah to the village of Putti.” Alex, Brian, Jordan, Judah, Doctor & Saftah Lieberman and the torah rode with Amos (our energetic driver), while Arne (the Dutch free lance reporter) and 150 Kinder Kits followed (almost too) closely behind. The apparently “220 km drive” took us Eastward along Lake Victoria for four hours on treacherously narrow, pitted roads and dusty boda-boda trails to the foot of Mount Elgon in the town of Mbale. When we finally reached Putti we were greeted by the village population, adults and children alike, charging the van with jubilant shrieking reminiscent of the peacock mating call. The torah as promised had arrived at its new home. The Putti village was quite remarkable. There were a few small shacks for homes, and five larger structures. Of these buildings, is a kitchen with a sign post memorializing the “The Challah Project,” which had been donated to help the Abayudayah Jewish peoples prepare their Sabbath bread. Also donated was a solar-powered chicken coup. Veterans noted that there were no chickens around last year, as they had been exterminated due to illness. Now, chickens roamed the dusty field and a sad-looking dog named “Master” wandered existentially. The children were many. The older ones would smile, but the younger ones were instinctively wary of “Muzungos” (whites). Of the Abayudayah, there were 130 children and another 40 adults in Putti. Jordan contrasted the age distribution to similar-sized Jewish communities he had met in Bolivia, where the stats were perfectly reversed, with shrinking communities. The history of the Putti Abayudayah started in the late 1800s. An elephant hunter named Semei Kakungulu began studying the bible. Upon further learning, he found his connection to the Old Testament, the books of Moses. He circumcised himself and his sons, a sign of Abraham’s (the first Jewish man) covenant with God. We don’t know how thrilled his middle-aged followers were about this initiation process at the time, but the incredible strength and devotion of the Abayudayah now speaks of their commitment to the Jewish faith. 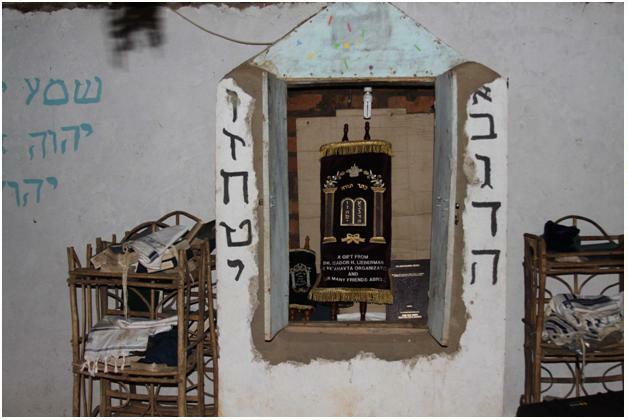 There are about a thousand Abayudayah in Uganda, but the orthodox ones (170) live in and around Putti. As they are not blood-descendants of Abraham, they have struggled for religious recognition for nearly one hundred years. The former dictator Idi Amin had banished them and the few who survived after the ban was lifted became the new generation of the Abayudayah. 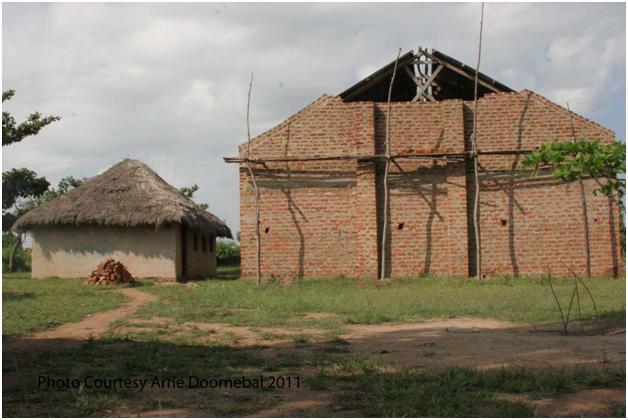 They prayed in a mud hut with a straw roof that was no larger than…well…a modest spine operating theater! A large Israeli flag covered half the back wall and Shabbat candles were stabilized with dried wax on the cement floor. Right next door stood the much larger new synagogue, which was about five times the size; aside from being large enough for all the Abayudayah, no wolf (or snake) could huff or puff or blow this brick synagaogue down. The village’s old synagogue next to the new one, which is currently being constructed. After unloading 15 boxes of Kinder Kits into the old synagogue, the villagers tied a sheet to four long sticks to build a “chuppah” (a Jewish ceremonial canopy used at weddings and Torah dedications). 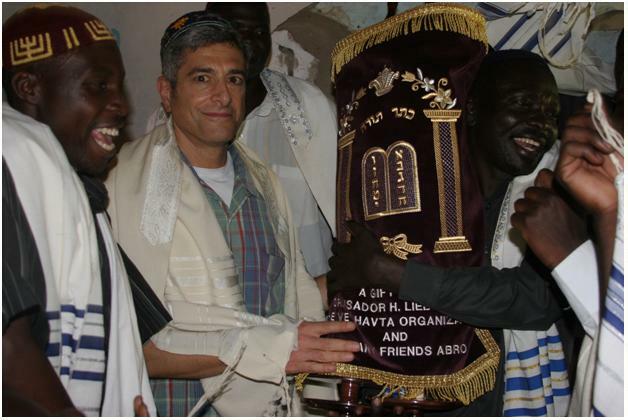 Dr. Lieberman and the very proud “Chairman of the Board” with the newly presented Torah. Torah in hand, Dr. Lieberman and community leader Rabbi Enosh marched under the chuppah around the village, then to the old synagogue while the villagers rejoiced singing their favorite song, “We Love Torah.” It was then ceremonially placed in the Aron Hakodesh (holy arc) next to the original paper Torah replica that so compelled Dr. Lieberman to promise the delivery of the real one. The joy of the Putti people was electric during the parade around the village with the Torah in hand. The entire community gathered in the synagogue for a special mid-afternoon service. Nobody could find the words to express their joy and gratitude, but that didn’t stop them from trying. The congregation captivated by the inaugural reading of the sefer Torah. Dr. Lieberman spoke of the meaning of being Jewish, and Jordan spoke of Veahavta and the Kinder Kits. The kids then swarmed Jordan like the killer bees buzzing about in the papyrus thatched roof just above us and each got a backpack which they wore proudly. Brian taught the kids how to load lead pencils and how to spin a dreidel (special Hanuka toy) in the palms of their hands. Joy and passion exuded from all present on this glorious day. 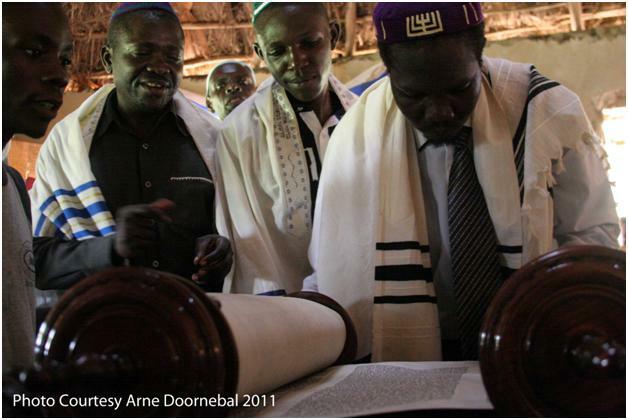 The new Torah next to the paper scroll. The Torah delivery delegation with the recipient rabbi. The most excited girl of the day runs through the village with what may be her second bag. 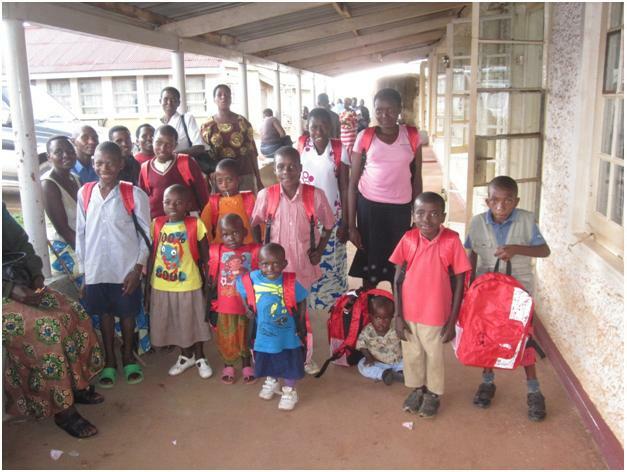 All the kids in Putti with their new Kinder Kits. Red looks good on the village. The next 24 hours passed like a dream. In Putti, the Sabbath started when we saw 3 stars in the night skies. No clocks, no watches, and no calendars to adhere by. Every day consistently has 12 hours of sunlight because they are so close to the equator: no real seasons either – just a couple rainy ones. We attended services on Friday evening and after services we broke bread with the villagers and ate the sweetest challah that we’d ever salted. We were invited to stay for dinner and we simply could not refuse! With no utensils, and the evening darkness over us, Arnie, Jordan and Brian graciously shared a plate while Dr. Lieberman and the Rabbi did the same. How do you share a meal in Putti? Why, by eating off of one plate, in the dark, with your hands, of course! On Saturday, Alex our hard-working IT man took charge. He followed along in English intrigued by a prayer service quite foreign to him. 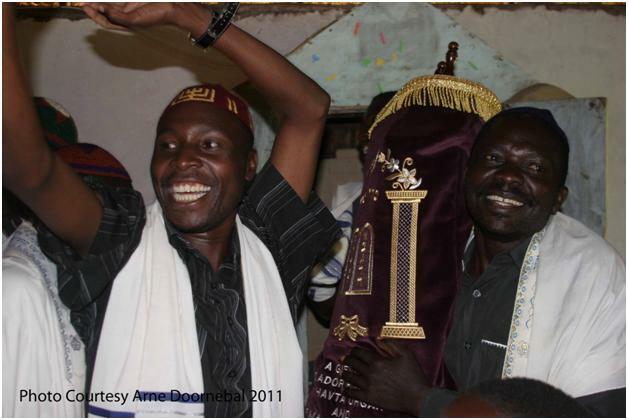 Even Amos piped up and asked about the meaning of Torah, Tallit and Tefillin. Alex taught the kids hopscotch, Simon Says and duck-duck goose much to their delight. Brian stirred flour, toured the agricultural grounds while Dr. Lieberman watched while Arnie interviewed the kind and patient Rabbi Enosh. Jordan chatted with the cantor, Moshe, discussing the Abayudayah’s love of music. After Shabbat they traded CD’s of their respective choirs – “When I Wake Up – the Music of Putti” for “This One’s a Kippah,” of the University of Toronto Varsity Jews A Cappella group. Judah meanwhile played volleyball and football (“soccer”) with the teens and tods, respectively, with imaginary nets. For the record Judah, who some called Jonah, is a unique individual. An accomplished outdoorsman with a BS of Electrical Engineering and a Masters in Geologic Sciences, Judah played an integral role in the torah project. 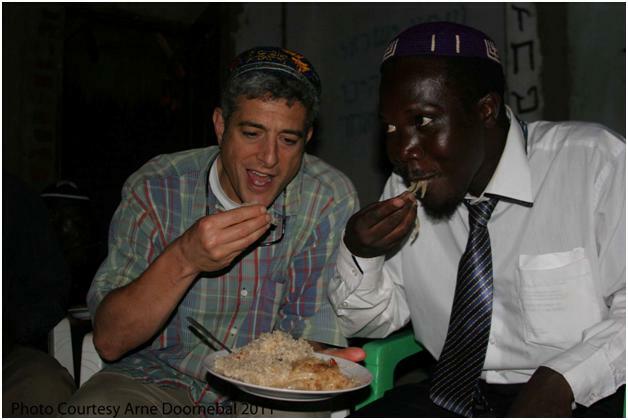 In addition to being the “mule” (bringing the Torah in its massive indestructible, everything proof, floatable case, on the connecting flight to Uganda), he built the website, helped raise money for the purchase of the torah, and worked closely with Doctors Lieberman and Rabbis Bloomenstiel and Zakon. As if that was not enough, Judah is staying in Putti for three weeks to install an irrigation system to water their crops, and teach them to raise chickens. How does Judah know how to raise a chicken farm, you ask? One of the 8 books he brought with him to Putti was “Chicken Farming for Dummies.” He will learn, he will teach, and he will hopefully come back alive, lest a cobra leaps into his jungle hammock. Energized by a restful Sabbath, the team departed Putti (minus Judah) and stopped at the Nile’s Bujagali Falls near Jinja, on the road back to Kampala. The Nile begins at nearby Lake Victoria and flows into the Mediterranean Sea at Alexandria in Egypt. Amos, not content with just driving us on the life threatening roads in Uganda, even offered to captain a raft for us on the Nile. At the falls we watched as risky local teens come bobbing down the rapids for money. Every year two or three teenage daredevils die in the Bujagali falls in their quest for a livelihood which pays them 3000 Ugandan shilling (the equivalent of $1) per trip down the rapids. Once we finally returned back to Kampala the team united again, we went for a late night dinner across the road from the apartment at “The Pyramids” Hotel and Casino. Dr. Sieminow chose the very adventurous “deep fried chicken,” while Alex, Jordan and Dr. Lieberman compared surgical skills as they dissected their whole Tilapia caught fresh from the lake. After that display of skills, Jordan was banned from the O.R. These were days of miracle and mysticism. From the Israeli flag in the man’s back mirror to the plastic Jewish star on our doorstep days prior, signs of the torah mission were pointing to success. But it didn’t end there. Our motel in Mbale gave us room number 18, which in Judaism symbolizes life, just before the torah arrived in Putti on Friday. 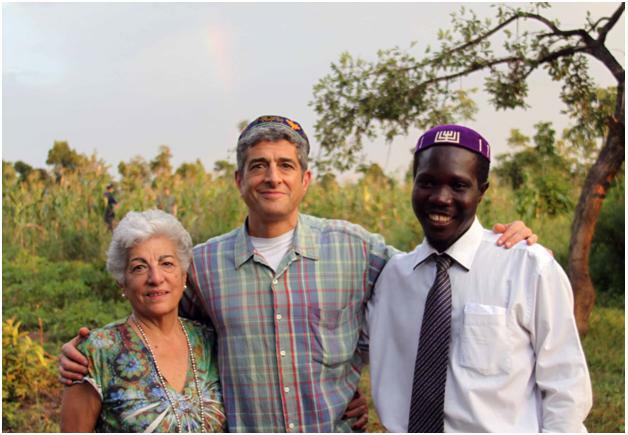 Soon after the torah presentation, we witnessed a rainbow in the field that the Rabbi pointed out then followed with the prayer memorializing the covenant between God and Noah. The story of Noah’s ark in the Old Testament tells us about the significance of the rainbow; it is a gift given from God to man to remind us of the sacred covenant: the covenant that he would never flood the earth with rains again. Only, it had not even rained in Putti. It was a very special moment for all of us, bringing full circle the promise of delivering a Torah to Putti. Dr. Lieberman, his mother “Safta”, and Rabbi Enosh. Rabbis and Rainbows may well sum up the day! And even more symbolic, after dinner we decided to assess the Ugandan definition of “casino” with a quick walk-through. While passing the roulette table, the empty-pocketed Jordan joked to Failla: “Let’s put 10,000 Shillings on number 18 for Putti.” The ball was thrown and sure enough, it landed on number 18. Despite the “could have, would have, should have” bantering, the whole sequence of events verified the importance of the weekend to the village of Putti and to all of us. On Sunday the team visited the Equator and nearby craft shops, sharing the events of days past and those to come. Disappointed by the closing of the famous French-Fries shop, talked up endlessly by the veterans, we ordered Nile specials and greasy fries at the next local restaurant and once filled moved on to visit the local neighborhood crocodile farm. There the 68 year-old monster croc Cleopatra recognized Dr. Lieberman and Failla, boasting its ancient teeth in their presence. Returning back to Kampala that evening was the most harrowing experience of most of the team member’s lives. We were inescapably involved it the worst traffic jam of our lives. Truly bumper-to-bumper, mirror-to-mirror, with boda-bodas crammed to fill the space in between. Veterans noted that it had never been this bad in previous years, and that the recent increase in car-shipping to Uganda has caused dramatic changes in street congestion in the city. We are convinced that Uganda has the best and worst drivers in the world. On arrival to Kampala we returned to Mamba point for avocado pizzas, said our goodbyes to Dr. Kris Semienow, who by the way just ordered a sealed bottle of water for dinner, in fear of the potential gastro-intestinal consequences of anything else, while on an airline flight. At Case, things were running like clockwork. The surgical patient was a 50 year-old female agricultural field worker with neck and lower back pain that rendered her unable to work. She also had numbness of fingers and toes. She was disabled by spinal stenosis, or narrowing of the spinal canal where the cord sits in the neck. After rounding on the wards, the dynamic duo (Dr. Mark and Dr. Selvon) performed a C5-6 Anterior Cervical Discectomy (removal of the disc) and Fusion (locking the bones together) (ACDF) procedure. The team strategically exposed the spine, from the front, and masterfully removed the degenerated disc, a rubbery cushion between vertebrae that normally acts as a shock absorber. In this case, it was bulging out backward and compressing the cord, contributing to her stenosis. The disc was replaced by a solid implant to maintain the space between vertebrae, while screws and a plate were applied to the bones to hold them together until the fusion consolidates. The surgeons completed the procedure then came over to heckle the Mulago team, gloating about their efficiency and finesse. Sherron decided to take advantage of her early dismissal and head into town to “get her hair did” (ie. braided). So much for roughing it! Sherron improvised in the operating room by rolling her own peanuts. On the wards at Case, Amy “the team Florence Nightingale” was administering pain medications where needed, while Ngozi “the team Joseph Pilate” was hard at work. Her patient F.T., who had few complaints yesterday, had a very uncomfortable physio session today, but was committed to getting up and back to school in September, so he pushed through the pain. Also pushing through the pain of the penalty box were Rocky Lieberman and his corner man Jordan, being “rope a doped” by three more patients. One was a follow-up scoliosis patient that Dr. Kris and Dr. Lieberman had operated on in 2007. She had matured into a beautiful young lady with a straight and pain-free spine. Her x-rays revealed a solid fusion, intact hardware, and a well-maintained correction with a balanced spine. The other two patients were ambitious young teens with aspirations of becoming computer engineers and businessmen, integral to Uganda’s future and who were not at all shy about sharing their ambitions. They both would eventually need surgery for their scoliosis and TB complications in the next couple of years, but wanted to finish high school first. Dr. Lieberman stayed in the center of the ring long enough to discuss all aspects of their predicament with them while displaying an incredible amount of patience, though he’d call it self-control, so as not to let the patients realize that he was rushing to get to the operating room before Siemionow and Ilalov did something he would regret (kidding of course – these guys are top notch!). Unbeknownst to Dr. Lieberman, outside the ring, the surgical action at Mulago had not yet even begun. The patient still needed pre-operative X-rays and the team was waiting on 3 units of blood for transfusion. While waiting, the Mulago orthopedics residents haunted Drs. Kirill, Kris and also Jordan with articulate and detailed stories of the talented and deadly snakes found in various regions of Uganda. Later that evening the entire building heard Dr. Ilalov screaming “Black Mamba” in his Malarone-enhanced dream world. The surgical patient P.T. was a 14 year-old girl with a spine so twisted that her ribs, over time, had pushed out and lifted her sternum (chest plate), leaving her with humps in both front and back. The multi-step surgery would require stabilization of her spine with hardware from behind, then removal of her sternum and fusion of ribs in the front, all the while maintain her ability to breathe in an already constricted rib cage. The decreased lung volume made this a particularly challenging case for our Polish pair responsible for maintaining her vitals (breathing, heart rate, and fluids) throughout the procedure. The first step took Drs. Lieberman, Siemionow and Ilalov six hours, and after review of the patient’s status Lieberman and the anesthesiologist pair decided that further surgery would subject her to unreasonable risk. She would need to recover first, and we will reevaluate when to proceed with step 2. 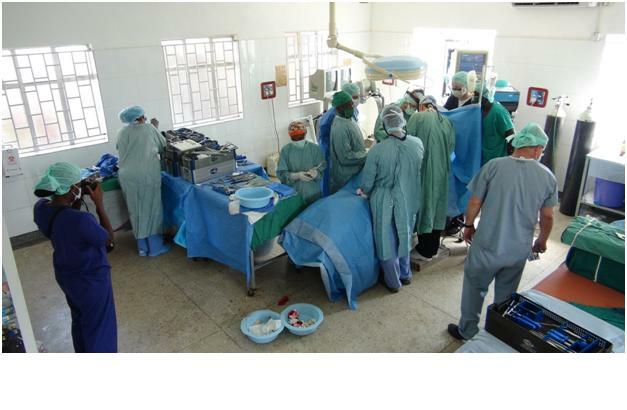 The entire USSM team working in the same OR during the long surgery of a 14 year old girl. Today was also a big day for our equipment manager Brian, who, after riding the pines for hundreds of spine surgeries, got to “scrub in” and assist the scrub nurse “sister Sara”. Giddy and camera-friendly, Brian worked diligently and learned that being a scrub nurse is a LOT harder than it looks. As with every good story there is always a silent hero. Some one behind the scenes, who quietly goes about his/her responsibilities, unassuming, barely noticeable and never getting the credit they deserve. Well this story is different. Alex was everywhere, was noticeable and performed above and beyond all expectations, especially with the team’s videography and IT needs. After an exciting day we retired to dinner, saddened by the departure of Dr. Mark (back to residency training), Dr. Selvon and Amy (on their honeymoon), and after waiting a comfortable two hours to be served, we filled our stomachs with curried delights. We split up to tackle three surgeries today. At Case, the A-team (Dr. Siemionow, Dr. Selvon St. Clair and Jordan) started the day with ward-rounds, visiting patients recovering from surgery. We discharged a 39 year-old woman who Dr.Kayanja and Dr. Selvon St. Clair operated on last Friday to relieve spinal cord compression that was causing leg numbness and pain. We also saw a new patient, H.K., a 4 year-old boy with muscle spasms in his limbs and delayed mental and physical development. We diagnosed him with Cerebral Palsy (C.P.) and explained to his parents that low oxygen levels before or at birth had caused irreversible neurological damage. 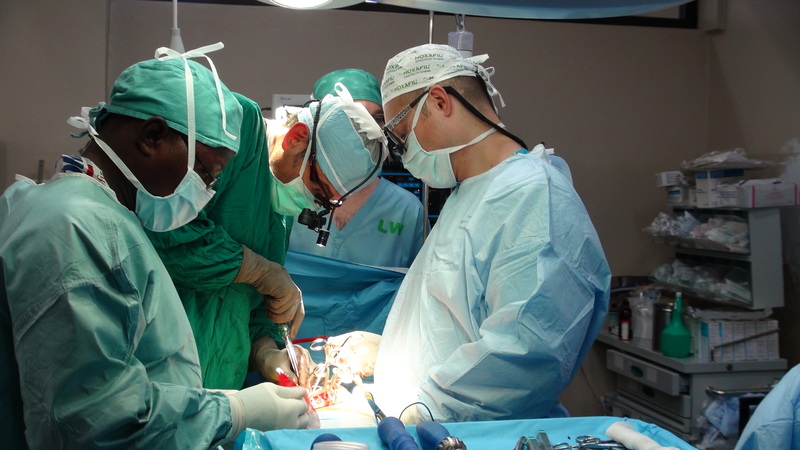 Dr. Siemionow, Dr. Selvon St. Clair and Jordan in surgery. Coincidentally, the surgical patient at Case, 15 year-old A.W., also had C.P. Fortunately, an international C.P. organization sponsored A.W. to have surgery to correct his severely hunched posture (kyphosis). The incision was 14 inches long and the team, under the command of Sherron (the REAL boss of the O.R.) and Nurse Betty (actually an anesthesiologist) brilliantly inserted 14 screws and two titanium rods to straighten out the spine. While the A-team was busy straightening spines, Ngozi and Amy ran physical therapy (P.T.) sessions for the patients recovering at Case. Amy administering medication to a post-operative patient. Ngozi worked for hours, sweat pouring down, in the overheated recovery wards. The complaints of the patients were minimal considering their operations, as Ugandans have a much different perspective on pain. Morphine is used sparingly, if at all, as addiction is overly feared. She was introduced to the new rehab ward, a tiny cubicle with one small bed and a chair. At first, Ngozi found herself butting heads with the staff physiotherapist, but things turned around when they discovered that our Texan hero had a doctorate in P.T. She was quickly volun-told to assist in patient teaching and to consult on a particularly difficult case tomorrow of a middle-aged man with 2 months of constant back and hip pain. 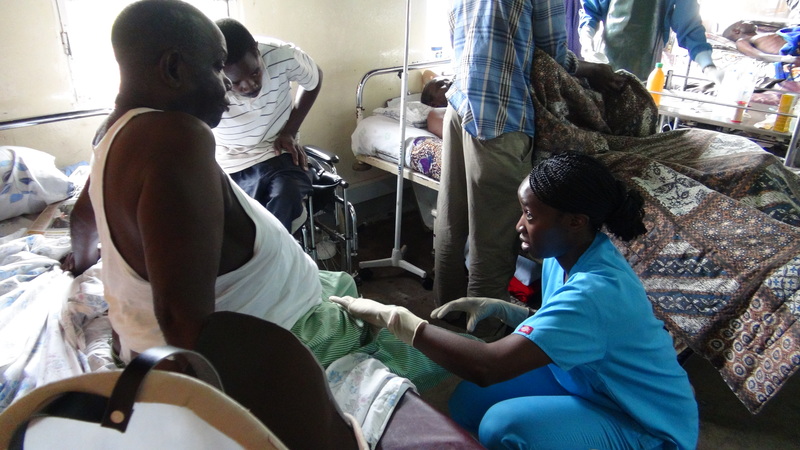 Ngozi, our physical therapist, working with a patient. At Mulago, the DOUBLE A-team worked on 2 cases. The first was a 73 year-old male doctor with an infection caused by a previous surgery performed by a local surgeon one year ago. He requested to be operated on by Drs. Lieberman and Kayanja to remove the hardware and clean out the infection. The procedure was a success and the doctor had “no pain” when he awoke – just some mild irritation from the breathing tube. 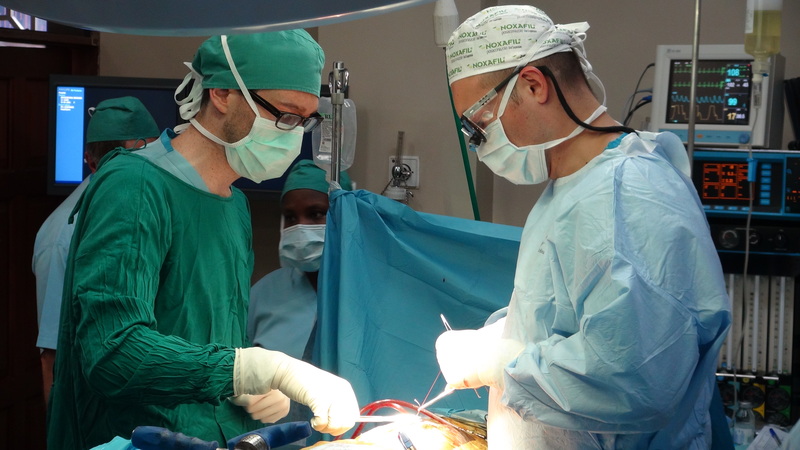 For the second surgery, Dr.Ilalov , (very slowly) acclimatizing to the Mulago O.R., worked with Dr. Robert Kasirye, the 4th year orthopedics resident at Makerere University College of Sciences in Kampala. They operated on a 35 year-old patient who broke her neck carrying a heavy jug of water on her head, causing tetraplegia. The surgery aimed at stabilizing her neck to reduce and maintain her ability to breathe on her own. Spinal levels C3, 4, & 5 keep the diaphragm alive! Brian sharpening some instruments for surgery. After a full day with all pistons firing, we retired to Mamba Point to sample the famous avocado pizza. Who knew that avocado worked with tuna, chicken, anchovies, pineapple and anything else one might normally put on pizza? After dinner, Dr. Lieberman ventured to the airport to pick up Noemi, his mother, and Judah, arguably the only Texan Jewish geologist in the world, and the securely-encased and very much-anticipated Torah scroll. 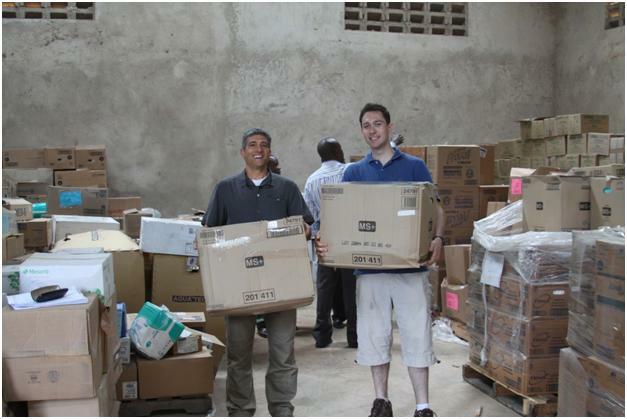 The morning began with a trip to the warehouse where tens of thousands of dollars of medical supplies were waiting for us. VeAhavta, a humanitarian organization based out of Toronto, organized and delivered a 40-foot container also containing 200 Kinder Kits, bags of school supplies for our spine patients and children in the village of Putti. We divided up the supplies: two-thirds would go to the state-run impoverished Mulago hospital and the rest to the Case Hospital for future use by the team and charitable use by the Case medical staff. For all those at VeAhavta we once again thank you for the tremendous effort. 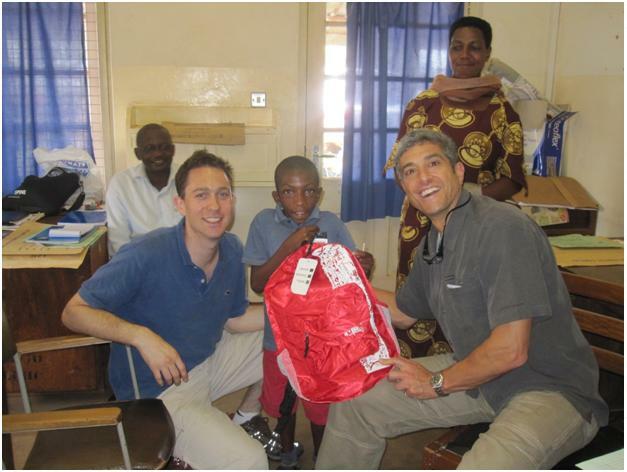 Jordan, Dr. Lieberman and the medical supplies and Kinder Kits donated by VeAhavta. Amy, Jordan and Dr. Lieberman returned to the penalty box to review the x-rays and CTs of yesterday’s patients. Each study was as unique and special as the children themselves. They were tremendous deformities but nothing too intimidating for Dr. Lieberman. Dr L then painstakingly described the expectations and implications of major surgery to these young patients overcoming the language and cultural barriers. It was imperative that both parties be in favour of the decision. Ultimately surgery was planned for five of the children. For the rest we prescribed exercise and annual follow-up, hoping the deformities will not progress to the point that precludes future surgery. 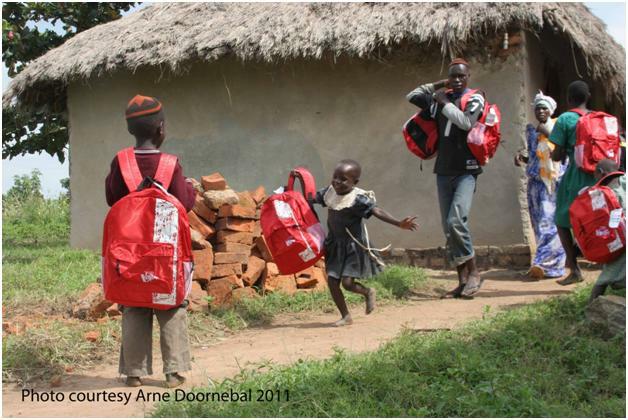 Fortunately, everyone left with a wide-eyed grin sporting their new red backpacks with notebooks, pens, and pencils for school. MedWish, an organization based out of Cleveland, who have been wonderful partners for many years now, also donated vitamins and toothbrushes, which will go a long way towards our patients’ general health. 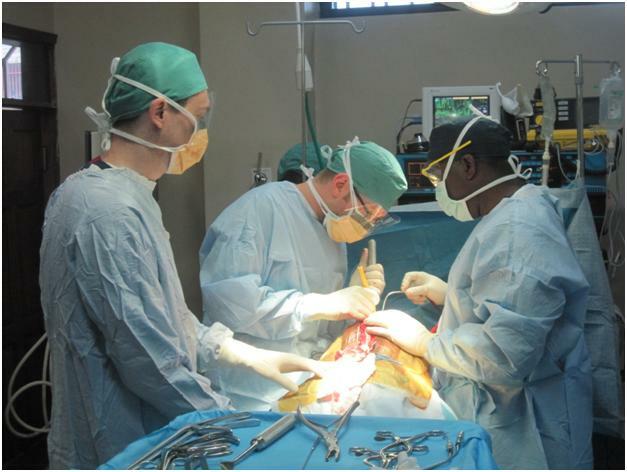 Dr. Ilalov, Dr. Kayanja, and anesthesiologists Kristoff and Zbigniew were kept busy in the O.R at Mulago. Their patient was a 63 year-old educated man who, 6 weeks earlier, summer-saulted forward off of his boda-boda (motorcycle) while riding along the country-side. Motorcycle accidents are the commonest cause of spinal cord injury here in Uganda. Two hours after his flip, he was discovered by a lady in the field who found him paralyzed below his shoulders, with his head sunken into his chest. On his instruction, she grabbed his ears and lifted his head back into place then called for help. Kids, do not try this at home! As if this trauma wasn’t enough, he was picked up placed on the back of another boda-boda and “bobbled” along for 2 hours down the cratered roads, with an unstable neck, already paralyzed, to the nearest hospital. It turned out he had dislocated the joint connecting two vertebrae in his neck (a bilateral jumped facet, in medical terminology) and the lady in the field actually “reduced” it to its original position. There was also a small vertebral fracture above the dislocation and damage to the spinal cord lining (a dural tear). Surgery to stabilize his spine and reduce further damage took seven hours. After the surgery it was clearly evident that he would have trouble breathing. Zbigniew, who has a special interest in mechanical ventilation, brought with him a CPAP machine (continuous positive airway pressure breathing device) and applied it to the patient (think of the mechanism as an air hose continuously inflating a tire at the same rate it is losing air through a puncture). We all have no doubt that Zbigniew’s efforts spared this individual further suffering and maybe even saved his life. 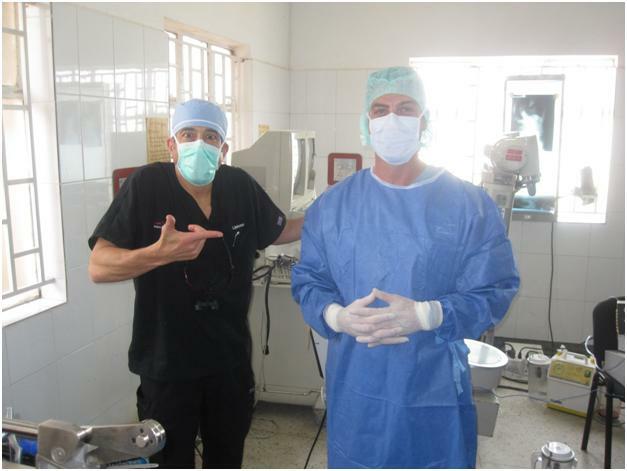 At Case, Dr. St. Clair and Dr. Siemionow operated on F.M, a 22 year-old male finance student. In 2005 he’d had surgery for congenital scoliosis which at the time he was told would be free of charge. After the surgery, he learned that a different doctor had operated on him and that he owed the equivalent of 2000 USD. His surgery today was a revision procedure, as the poorly-placed instrumentation from 2005 was no longer effective. He was also concerned about returning to his studies but we reassured him that his recovery would take 4-6 weeks. The surgery took 6 hours, which coincided perfectly with the passionfruit-flavoured “6-hour-power” juice that Dr. Siemionow consumed beforehand. F.M. asked many questions about the prevalence of scoliosis in Uganda. In more developed nations, pediatricians and elementary schools screen for abnormal spine growth annually from a young age. When it does occur, measures are taken to prevent extensive curvature. Unfortunately Uganda’s population seems to have missed out on the epidemiology lecture and the incidence is disproportionately high. 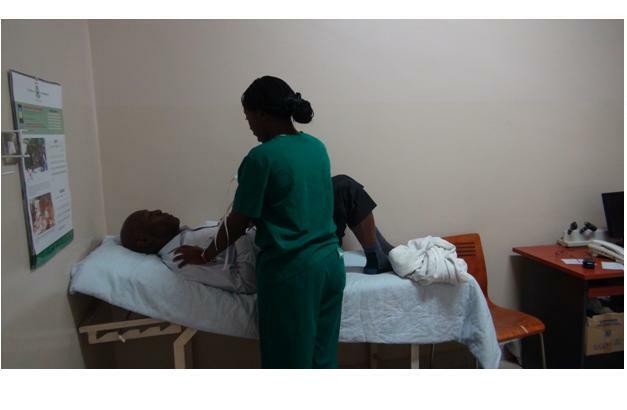 Even with screening the burden of spinal deformity in Uganda is substantial. 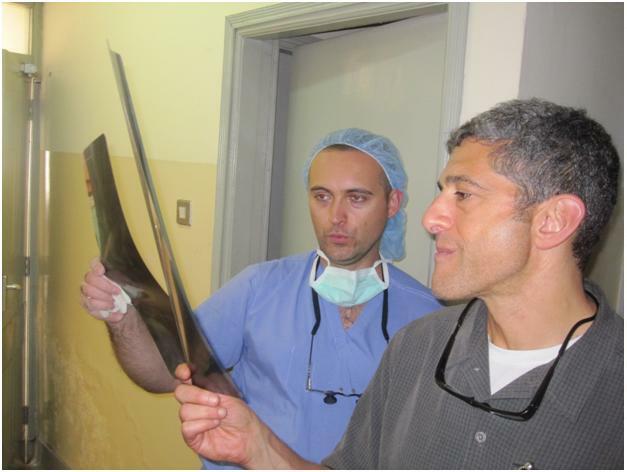 Dr. Lieberman and Dr. Ilalov discuss the X-ray and potential to operate on a 20-year old man who fell 70 feet into an empty toilet well under construction. The man waited 4 days until he was discovered. He suffered several broken and dislocated vertebrae. For dinner tonight we went to the all-time favourite Khyber Pass Indian Curry House. 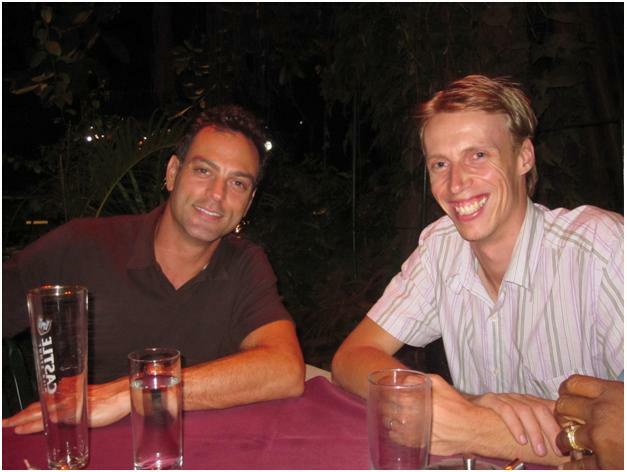 The discussion over the flavourful curry dishes was dominated by Arnie, a free-lance reporter from Norway who was interested in learning more about the spine and Torah missions. Our (now) cleanly shaven equipment manager Brian Failla and Norwegian journalist Arnie at Khyber Pass. “I wouldn’t have made it through surgery today without that 6 hours of pure PASSION!” – Dr. Kris S, with reference to the energy drink. 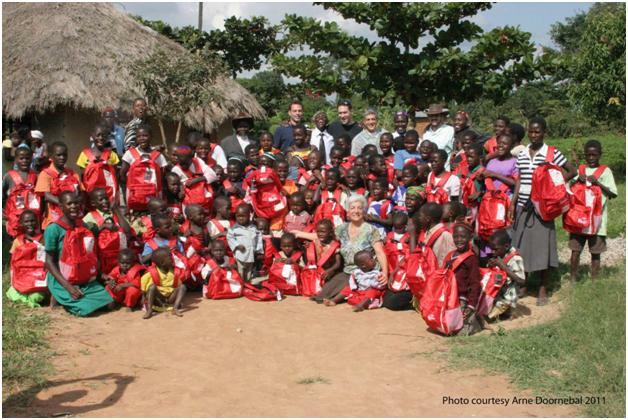 Some of our patients and their family members with their Kinder Kits!